This tutorial aims at Openstack integration with CEPH Block device or implementing Rados Block Device(RBD) as the Storage Backend for Openstack Block Storage Service . To know more about RBD please see my post on CEPH ( The blog links are available in the Recommended Readings section) . To use Ceph Block Devices with OpenStack, you must have access to a running Ceph Storage Cluster first. So make sure you have configured a CEPH storage Cluster and is in active+clean state as shown in the screenshot below. 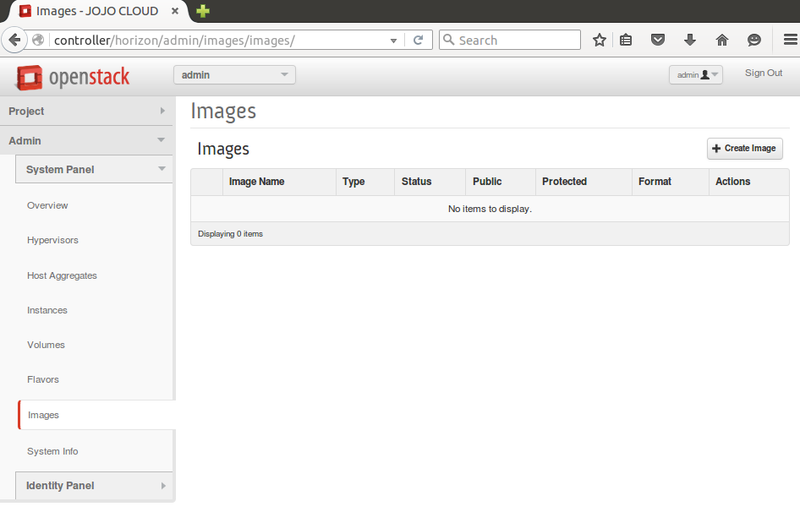 In Openstack, Glance Service or the Image service manages images for VM instances. The VM uses the bootable images from glance to boot for the first time. Intregrating this image into CEPH means, the VM images that Glance Service creates is stored in the RADOS cluster rather than storing it in the same physical node where the glance service runs. The Block Storage Service of Opensatck(cinder) uses cinder-volume service to manage Block devices. All the required storage space for a VM instance is provided as block storage. Openstack uses block devices to either provide bootable volumes to VM’s or to attach volumes to running VMs. The storage space is taken from the same node where the cinder-volume service runs. In my Openstack configuration, a separate node is used for serving Block devices. 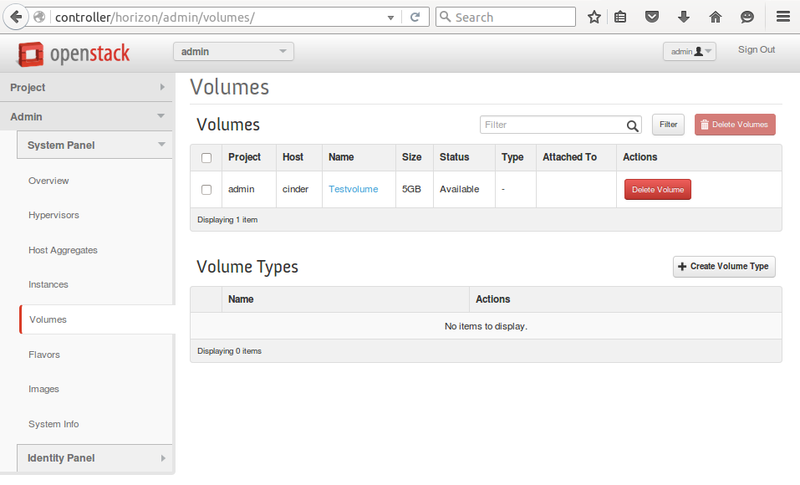 Integrating volumes with CEPH means that, the volumes created with Openstack is actually provided by the nodes participating in the RADOS cluster. The entire Block Device is stripped and stored as objects in CEPH, but virtually we get a block device as such to use with VM’s. By default when you boot a VM in Openstack, the disk appears as a disk on the node that runs the hypervisor portion of compute service(usually under /var/lib/nova/instances/<uuid>/). In our case its the compute node that holds the files for the operating system of the VM’s. Integrating this with CEPH makes the files for the operating system of a VM to be stored on the RADOS cluster in a separate pool. This allows us to boot every VM inside CEPH directly without using Openstack Cinder Service, which is advantageous because it allows us to perform maintenance operations easily with the live-migration process. Note : Ceph doesn’t support QCOW2 for hosting a virtual machine disk. Thus if you want to boot virtual machines in CEPH, the Glance image format must be RAW. Now lets see how the integration is done. By default, CEPH creates a pool named rbd numbered 0. We create three more pools named VM, images and volumes to store VM data, glance images and cinder volumes respectively in CEPH cluster. For this login to the ceph-deploy admin node and run the following commands. Here 128 is the number of Placement Groups(PG) each Pools has. Make sure the three new pools are listed as shown in the screenshot below. The nodes running glance-api, cinder-volume and nova-compute act as Ceph clients. Each of these nodes requires the ceph.conf file. Copy /etc/ceph/ceph.conf file to each of these nodes as shown below. Create a new user for Cinder and Glance. Execute the following commands on the ceph-deploy admin node. Add the keyrings for client.cinder and client.glance to the respective nodes and change their ownership as shown below. Nodes running nova-compute(Compute node) need the keyring file for the nova-compute process. Add the keyring file as shown below. Note down the uuid of the secret for configuring nova-compute later. In order to use CEPH block device(RBD) by default, configure Glance as shown below. Edit/modify the entries as shown below in /etc/glance/glance-api.conf under the [DEFAULT] section on the controller node. 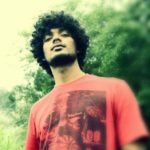 To avoid images getting cached under /var/lib/glance/image-cache/, add the following entries under the [paste_deploy] section in /etc/glance/glance-api.conf. OpenStack requires a driver to interact with Ceph block device RBD and also the pool name for the block device. On the cinder node, edit /etc/cinder/cinder.conf by adding the following entries under the [DEFAULT] section. On the compute node, edit/modify the ceph configuration file /etc/ceph/ceph.conf with the following entries under the [client] section. Edit/modify the /etc/nova/nova.conf file with the following entries under the [DEFAULT] section. Restart the required Openstack service as shown below. 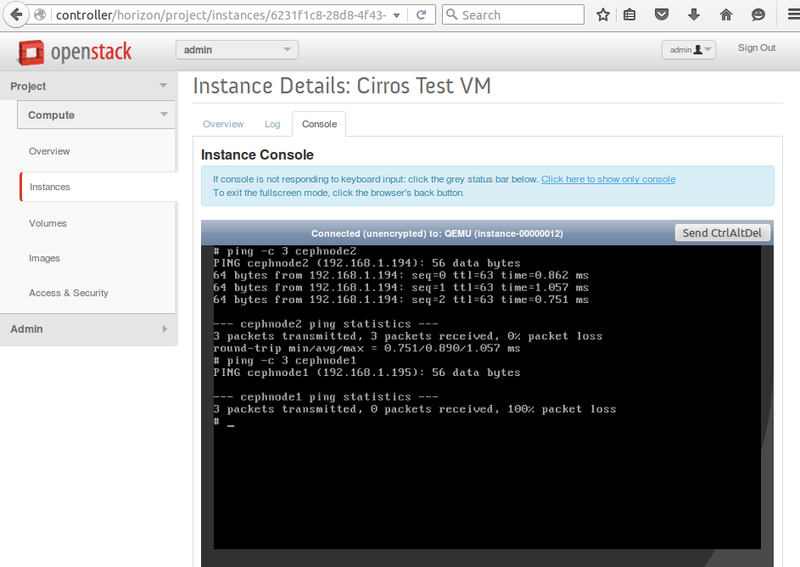 Now the Openstack is ready with Storage Backend as CEPH. All the volumes created are stored as objects in the Volumes pool, glance images created are stored as objects in the images pool and the VM data is stored as objects in the vms pool. To verify the integration, we need to check whether the volumes, or VM’s or images created in Openstack(via Dashboard or CLI) are actually stored as objects in the respective CEPH pools. 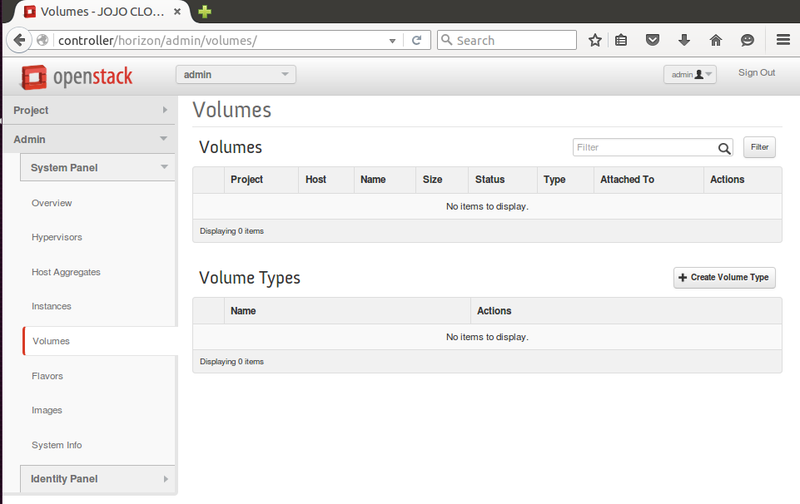 The below screenshots show the ceph pools data when there are no VM’s, images and volumes created in Openstack. For the above three cases ie; No VM’s created , No Instances created and No Images created, see the below screenshot of the respective CEPH cluster Pools. All the pools are empty with no objects stored. 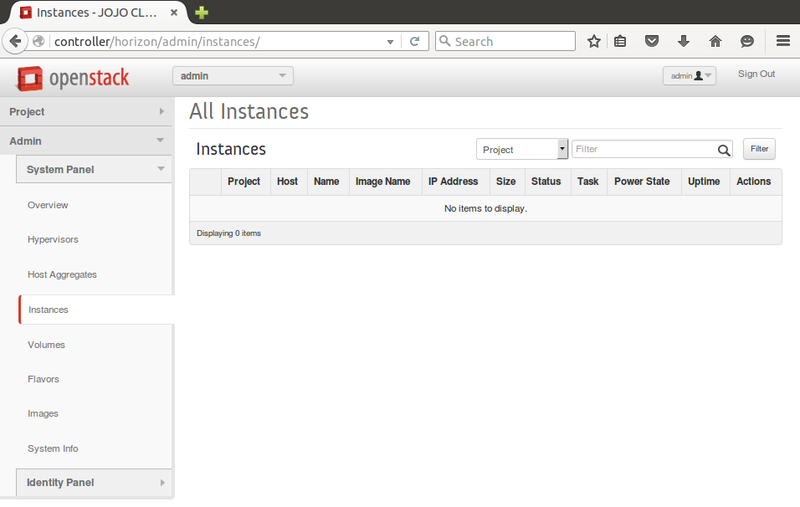 Now lets see the scenario where we create an Instance, Image and a Volume as shown in the screenshots below. The nodes cephnode1 and cephnode2 are the storage nodes that constitutes the RADOS cluster in my CEPH configuration. See the CEPH Cluster tree in the screenshot below . 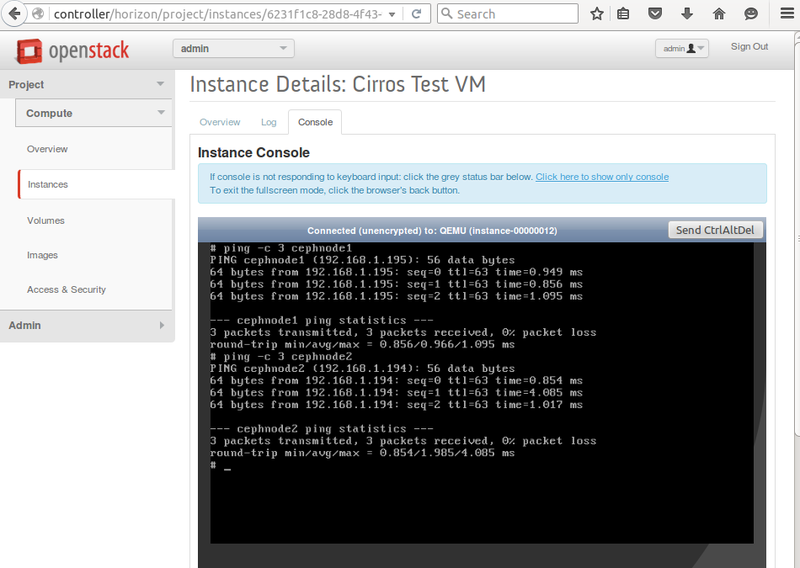 The below screenshots show that both the nodes in the CEPH cluster are UP and the Instance in Openstack(Cirros Test VM) is UP and running. The ping is done from the console of the VM. Now I’m shutting down the first storage cluster node cephnode1. As you can see from the screenshot below that the ping on cephnode1 shows 100% data loss or the node is DOWN. Even though one among the storage node is down, the instance or the VM is still UP and running. The ping is done from the console of the VM. This is one among the major advantages of using a CEPH storage backend to use as a Block Storage Service with Openstack.